SUPER-insulation! Airtightness! 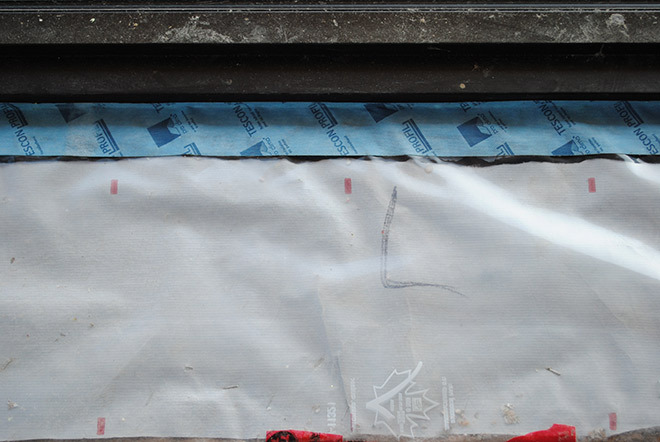 The staples of a passive house. 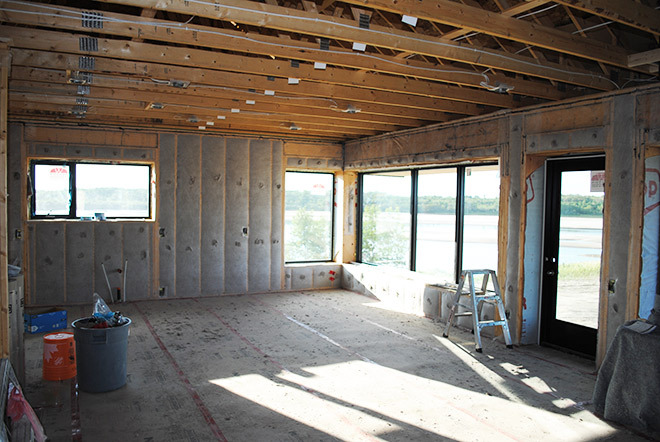 There are seemingly innumerable weighs of building a super-insulated home. Once you venture outside of the conventional 2×6 walls with 1-2″ of EPS foam, there suddenly opens of a plethora of options. I won’t go into as I’ve talked about it before, in us choosing super-insulated walls system and the double-stud deep wall framing. Now what you put between those walls is just as important as how you construct those walls. In our case, we chose to use dense-packed cellulose. 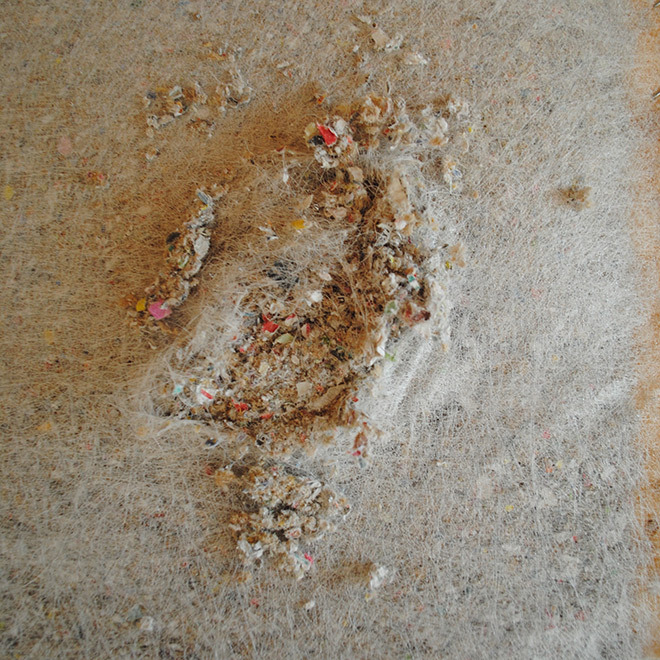 Cellulose insulation is a made from recycled newspaper or other wastepaper and treated with borates for fire and insect protection (taken from GBA). 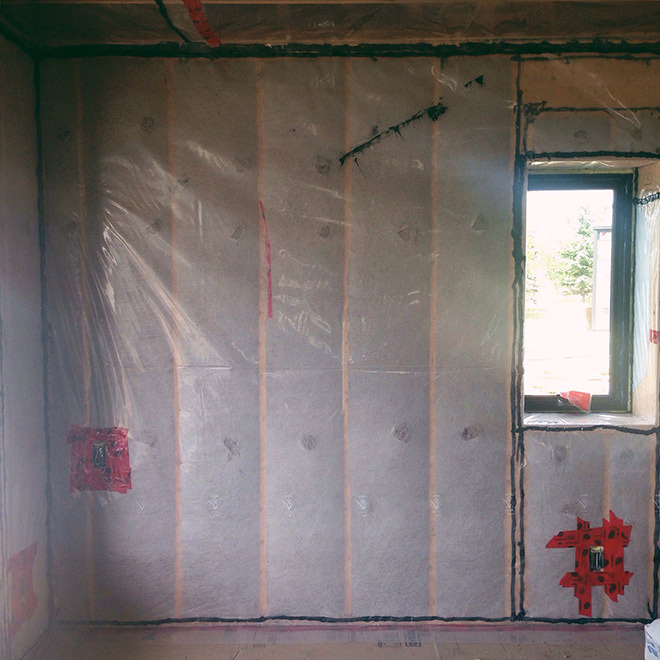 Dense-packed cellulose is really, just what it sounds like: They pack it like crazy into the wall cavity – but not too crazy. In fact, the ideal balance between too loose and too dense is about 3.5 lbs per cubic foot. If it is too loose it will settle and result in poor insulation over time. The denser it is the more resistance to air leakage (the vapour barrier obviously reduces this further) and the better the insulation. However beyond about 4 lbs per cubic foot of density you are at risk of blow-outs (or the drywallers will not be able to work with your crazy wavy walls). At 3.5 lbs per cubic foot and with 16″ thick walls, our R-value is a whopping R56 for the exterior above-grade walls! We contracted a company, Westcan Insulators Inc., who has extensive experience with super-insulated homes and a wealth of knowledge in energy efficiency. At our preliminary meetings they provided us with so much valuable information (have preliminary meetings with all trades presents – it truly is invaluable). It was so reassuring to have them on board, as really in building an energy-efficient home, the insulation and airtightness are the most important aspects. If you don’t have this right, you really don’t have anything. As Rob Dumont said: “Anything that has moving parts will fail; in fact, it must fail, because there is no such thing as a perfect bearing.” Therefore, passive systems are always better than active systems and insulation and air sealing, if done well, will have the greatest return (for the lowest cost) over the lifetime of the building. 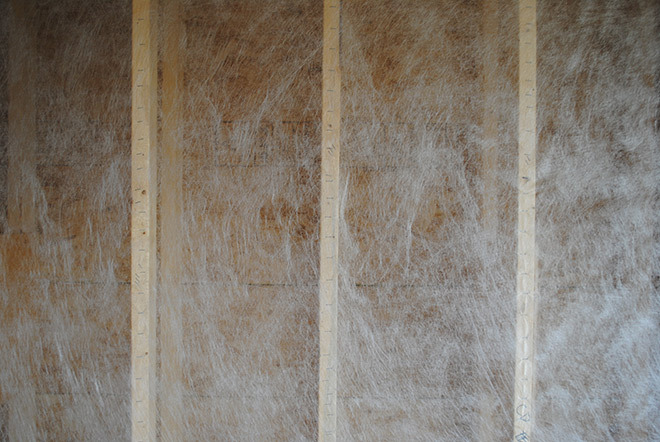 On day 1, the crew came in and wrapped the walls with InsulWeb, a mesh that holds the dense-packed cellulose in place while spraying. They go through a buttload of staples to hold this onto the studs. They have to put a staple every inch along every stud, so you can imagine how many staples that would be. Crazy. The next day, they bring out a big 5 tonne truck and using a 3″ wide metal hose they make a hole at one-third and two-thirds of the way up each stud bay. They then proceed to essentially filling the walls with the entirety of the truck. In actual fact, they unloaded about 6000 lbs of insulation into the walls alone (holy crap!). Here is a close-up shot of the cellulose and penetration. You can nearly read the newsprint. The next day came the vapour barrier and air sealing. This actually took the better part of five days for them to complete, but they did an excellent job (by the looks of it – we will really find out when we test it with a blower door in the next few weeks). 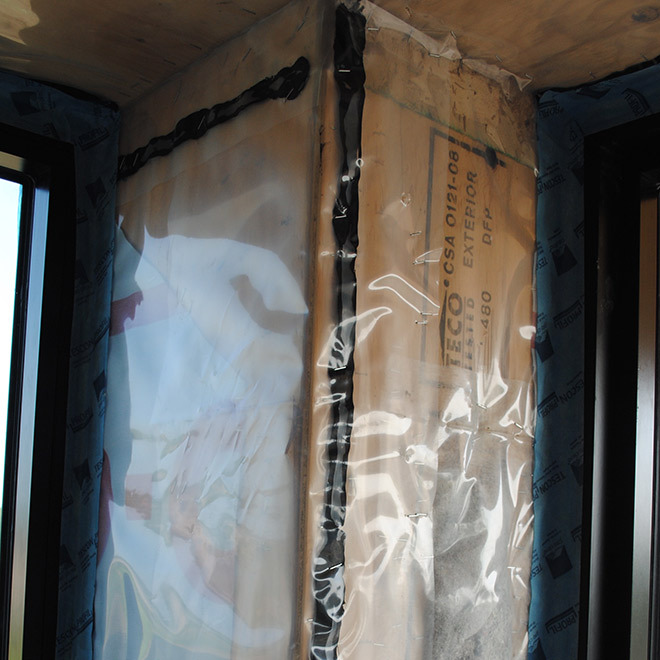 Airtightness is really equally as important as the insulation – perhaps even more so. Air leaking into and out of a building is not efficient no matter how much insulation you have in the walls. They used 6 mil poly for the vapour barrier with acoustic sealant at every seam. Each seam was also taped to ensure another layer of added protection, though truthfully this is probably unnecessary (from what we have been told, with this insulation alone, without the vapour barrier, would surely pass the R2000 airtightness requirement of 1.5 ACH @ 50 pascals), but it’s not hard to do and once the drywall is up you can’t go back and add more. Around the windows and doors though we spent a bit of money and purchased Tescon Profil tape from 475 Building Performance. The stuff runs at $45 per roll, which is certainly a premium price versus the $9 per roll of good ol’ Tuck tape (the latter of which we used around all other seams). 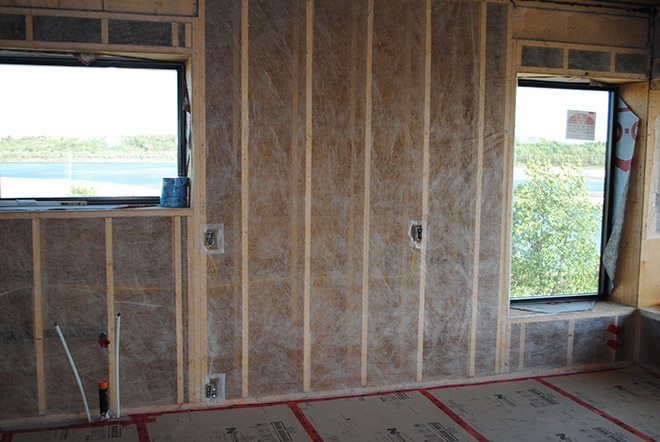 However between the walls and the windows/doors, there isn’t the layer of protection of the dense packed cellulose insulation (although they did spray foam around each window and the rough opening), so we felt the extra price could be justified here (to do the whole house in the Tescon Profil tape would be simply cost-prohibitive [although some people do it]. For the marginal gains you “might” make in airtightness, you would never save enough money on the long-term to justify that huge upfront cost, in my humble opinion).